The Urban Outfitters/Kent State sweatshirt controversy seems unbelievable to me — but maybe I just don’t realize how little companies know about the schools whose names get put on the front of products those companies sell. 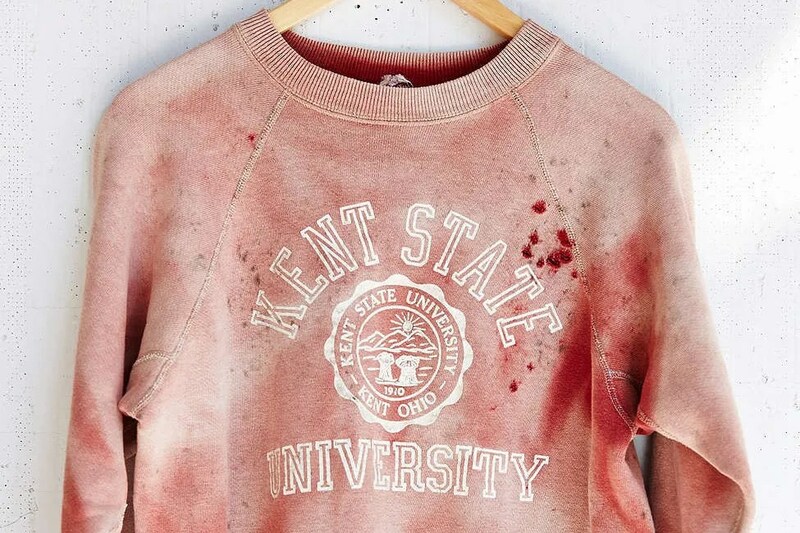 In case you missed it, Urban Outfitters was offering a faux vintage Kent State sweatshirt that was daubed in red paint smears and splots. Of course, anyone who knows anything about Kent State and its history would immediately think that the sweatshirt was referring to the shootings that killed four Kent State students and wounded others on May 4, 1970. Not surprisingly, people were outraged by what seemed like a sick effort to profit from a terrible American tragedy. Urban Outfitters claims, however, that it “was never our intention to allude to the tragic events that took place at Kent State in 1970 and we are extremely saddened that this item was perceived as such.” Which is worse: trading on a tragedy, or being so obtuse and insensitive that you don’t recognize that a red-spattered Kent State shirt would inevitably be thought to allude to the May 4 shootings? It’s a close question in my view. Urban Outfitters is one of those stores that tries to portray the most hip image possible. I wouldn’t be surprised if the people who designed the offending sweatshirt had never heard of the Kent State shootings. If you treat everything as just another “brand” and make no effort to understand an institution or its back story, this kind of embarrassment inevitably is going to happen. Urban Outfitters should be ashamed.